Of course, casual runners don't want something aimed at 'athletes', and athletes don't want something aimed at casual runners. Realistically, these are a cheap, classic, old-school band, like your mum wears and a Fitbit Alta/Fitbit Charge rival. Athletes will get a running watch instead. Looking like a rebadged Samsung Gear Fit device, Galaxy Fit uses Bluetooth 5.0. As you can see, comes in black and silver finishes. The more affordable Fit e comes in white, charcoal and yellow. We did wonder if the 'e' bit of Galaxy Fit e meant it might have an eSim or a more 'e'xclusive finish but it turns out to stand for 'expensive, not'. It's cheap as chips. It's for 'e'veryone. EVERYONE! Both devices are water resistant to 50m or 5ATM. Both have a heart rate meter and barometer (to track altitude rather than to tell you the weather). The Fit also has a gyroscope. Neither has GPS although it may turn out you can tap into your phone's, to track outdoor runs, cycle rides and whatnot. There's automatic tracking of certain core activities, as found on Garmin and Fitbit bands. Start to do a walk, run, bike, row, or elliptical workout (or a 'general dynamic workout', whatever that means) and both bands will track it of their own volition. You can also manually select 'more than 90 different activities' via the Samsung Health app. 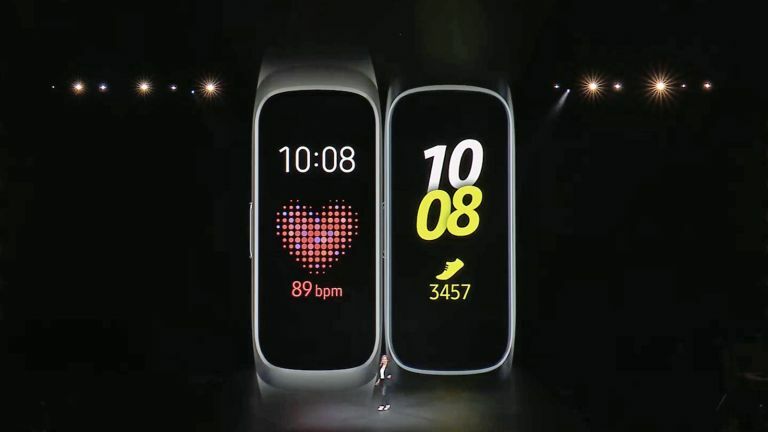 This is more a matter of labelling all your exercise so you can see it later – the Samsung Fit is not really going to track a hike in a different way to a yoga class in terms of metrics. Pricing: £89 for Galaxy Fit, and £35 for Fit e.
Battery life: there is no info on this, which is a bit ridiculous. We'd really expect a week at least. The Fit e has a smaller battery, but then it also has a smaller and crappier screen, less powerful processor, and fewer sensors, so battery life should be about the same. Galaxy Fit and Fit e: should you buy one? The world of fitness trackers (as opposed to watches) is a difficult one, because since the collapse of Jawbone it is dominated by Fitbit, and Chinese brands trying to rip off Fitbit. Samsung, however, joins Garmin as a 'proper' tech brand, feasting on the scraps left by Fitbit. Given the price points we assume the Galaxy Fit has a heart rate monitor that can cope with more intense exercise, while the Fit e's will be more suited to monitoring your pulse once every hour or so, letting you track your resting heart rate, stress levels and 'wellness'. It might be able to identify any fluctuations that could mean you might keel over at any moment, so you better go see your doctor right away. Both bands will track how well you sleep and for how long – that's a key feature of this type of band. In short, the Galaxy Fit is for your brother, who works out a lot (but not all that much, or he'd have a running watch or Apple Watch 4) and the Fit e is for your mum, who likes to religiously track how many steps per day and hours of sleep she gets. I'm not sure I'd buy these over a Fitbit Alta, Alta HR or Charge, but anyone with a Smasung Galaxy phone is likely to be tempted by their looks, low price and easy compatibiity. • Galaxy Fit and Fit e will both go on sale April 26 2016.